H.E. Akbar Torkan, Iranian president\'s advisor for free zones, received in his office in Tehran H.E. Yahya bin Said bin Abdullah Al-Jabri, Chairperson of the Special Economic Zone Authority Duqm (SEZAD) and his accompanying delegation as part of the promotional campaign (Duqm Invites You). SEZAD organized this campaign with the participation of a number of government agencies and companies operating and investing in the Zone. During the meeting, they discussed means of cooperation between the Sultanate and Iran in many areas related to the free zones. Al-Jabri provided Torkan with an overview of the Special Economic Zone Duqm (Zone) with its geographical location and the incentives and facilities it offers for investors. SEZAD Chairperson touched upon the projects in the pipeline in the Zone and the focus sectors. For his part, H.E. the Iranian president’s advisor for free zones, indicated the characteristics of four free zones in Iran, namely Chabahar, Qeshm, and Bushehr and Arvand. He pointed out that these zones offer many privileges and incentives for investors and feature a variety of heavy and petrochemical industries. The meeting included putting forward many ideas for cooperation between the Special Economic Zone in Duqm and Iranian free zones, including cooperation in marketing. H.E. Yahya bin Said Al-Jabri invited to H.E. Akbar Torkan to visit the Special Economic Zone in Duqm to get a firsthand experience of the characteristics of the Zone and projects implemented in it. On the other hand, H.E. Yahya bin Said bin Abdullah Al-Jabri and his accompanying delegation met with H.E. 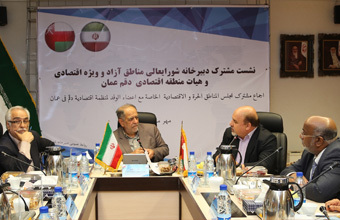 Mohammad Saeedi, Managing Director of the Islamic Republic of Iran Shipping Lines (IRISL). During the meeting, they discussed cooperation between the two sides. H.E. Al-Jabri asserted that the Special Economic Zone in Duqm has a high ability to provide the services IRISL needs, especially in the area of ship repair services. H.E. Mohammad Saeedi expressed the desire of IRISL to cooperate with Duqm Port and the dry dock.